The Companions (Greek: ἑταῖροι, hetairoi) were the elite cavalry of the Macedonian army from the time of king Philip II of Macedon and achieved their greatest prestige under Alexander the Great, and have been regarded as the best cavalry in the ancient world and the first shock cavalry. Chosen Companions/Hetairoi formed the elite guard of the king (Somatophylakes). 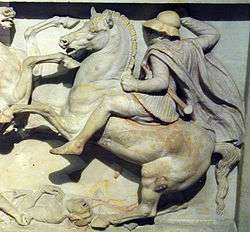 The Companion cavalry of the Diadochoi (Alexandrian successor-states), were even more heavily equipped. 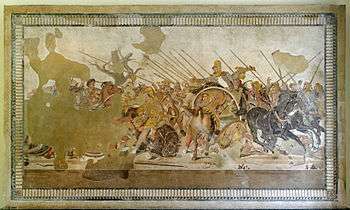 Seleucid Companions were noted to have worn lighter, but not otherwise dissimilar, equipment to the cataphracts at the Battle of Magnesia in 190 BC, which may have included partial horse armour and leg and arm protection. Ptolemaic Companions were also equipped with a large round aspis cavalry shield unlike the Companions of Phillip and Alexander. Hammond, Nicholas G. L. (1998). "Cavalry Recruited in Macedonia down to 322 BC.". Historia: Zeitschrift fur Alte Geschichte. 47 (4): 404–425. JSTOR 4436520.